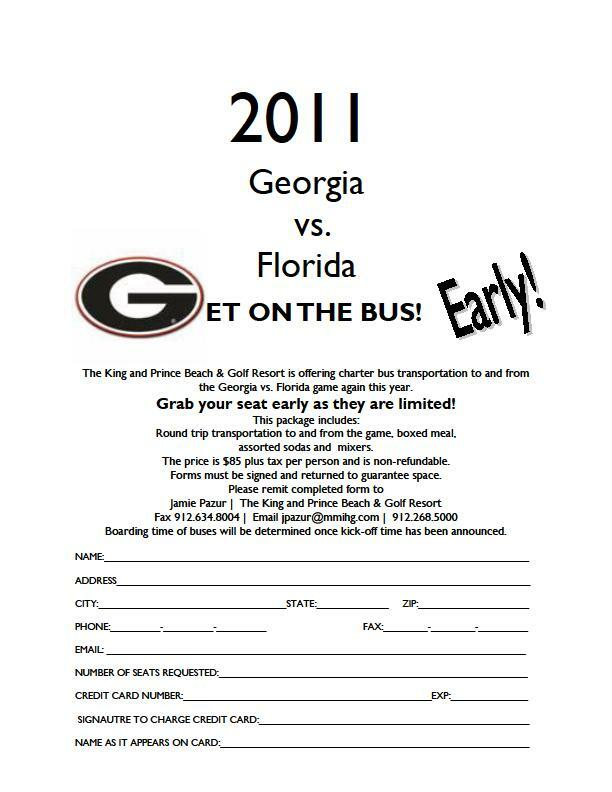 Get on the Bus for GA/FL Game Weekend! With the excitement of the 2011 Georgia vs. Florida Football Game just two weeks away, we here at the King and Prince Beach and Golf Resort know that traffic can be a drag. That’s why we’re proud to announce that we will be providing transportation both to and from the big game this year. Guests are invited to travel in comfort on one of our four luxurious motorcoaches without the worry of navigating annoying big-game traffic or arranging for designated drivers. The King and Prince has you covered! Enjoy the party and the game this year without the worry of arranging designated drivers or hiring cabs with the knowledge that, with the King and Prince, you have a safe ride to and from the game. Not a guest of the King and Prince? Not a problem! You’re invited to the party too. Bus tickets are $85 per person. Fill out the form below and fax it to the resort at the number listed.